This recipe takes time to prepare, but can be assembled up to an hour in advance and taste wonderful. Serve as a starter. Make an incision down the back of each prawn and pull out the digestive cord. Rinse the prawns under the cold tap and pat dry before chopping roughly. Place in a bowl with the spring onions, ginger, soy sauce, sake, honey, water chestnuts and egg white. Mix thoroughly, then cover and chill for a minimum of 20 minutes. Continue by making the dumpling wrappers. Sift the flour and salt in a bowl. Measure out 125ml cold water, and mix in enough of it to make a stiff but pliable dough, then knead until it is silky smooth and pliable. Cover with clingfilm and rest for 20 minutes. You can make the dipping saucewhile it is resting. Divide the dough into 30 walnut-sized balls. Flour your working surface and liberally flour a tray that will fit in the fridge. Take a ball, lightly flour and flatten it out in the palm of your hand before rolling it out into a thin, 7-8cm diameter disc. Lightly flour and lay on a plate. Continue until all are rolled. Then place a teaspoon of the prawn mixture in the centre of the first disc. 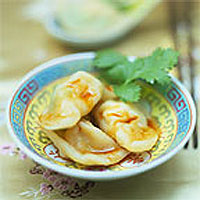 Fold over and pinch together the edges so that they encase the filling and form a half moon-shaped dumpling. Place on a the floured tray and continue until you have finished the filling. Chill, lightly covered, until you are ready to eat. Bring a large saucepan of water to the boil over a high heat. Drop in a couple of handfuls of dumplings and gently stir, once, to prevent them sticking to the bottom of the pan. As the water returns to the boil, add a small cup of cold water to lower the temperature to a simmer. Repeat the process when the water returns to the boil again. This will prevent the dumplings breaking apart by boiling too vigorously. As the dumplings cook they will float to the surface. Check they are cooked by removing one and cutting it in half. Remove the cooked dumplings with a slotted spoon and keep warm. Continue cooking the remaining dumplings, and serve piping hot with the dip. To make the dip, put all the ingredients, except the sesame oil, into a small saucepan, along with 200ml water. Bring to the boil, stirring regularly, until the sugar has dissolved, then simmer for 20 minutes. Strain into a clean container and once cold, mix in the sesame oil. Serve with the dumplings.